Berkeley Law Dean Erwin Chemerinsky speaks with Mark Harris' pre-law students during his campus visit Tuesday. People on college campuses hold a wide range of views, and the First Amendment gives everyone the right to express their opinions. But restricting speech at a public institution — even when what’s said is unpopular, offensive or even hateful — is against the law. 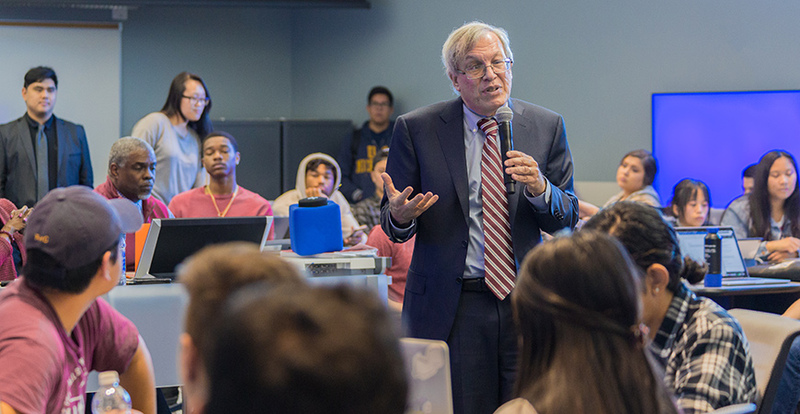 Erwin Chemerinsky, dean of the UC Berkeley School of Law, shared that and other messages with students, faculty, staff and administrators at UC Merced this week as part of the Chancellor’s Dialogue on Diversity and Interdisciplinarity lecture series. “Words do matter, and one of the most important things (campus administrators) can do to validate students who would be upset by hateful speech is to strongly denounce it. The best remedy to speech we don’t like is more speech. 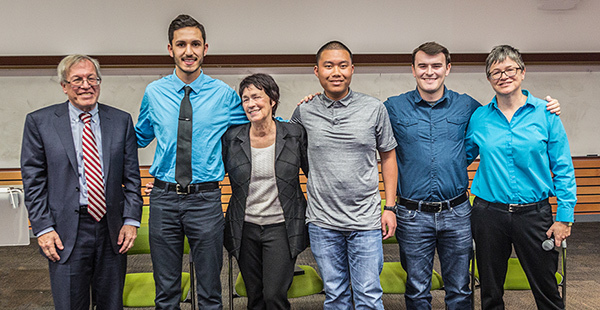 Chemerinsky, with student panelists Kamyar Nekoui (from left), Jason Matthew Miguel and Harrison Duran, and Professor Nella Van Dyke. Sociology Professor Nella Van Dyke moderated the event. Van Dyke and Harris each wrote op-eds on free speech ahead of Chemerinsky’s visit. The majority of students who asked questions and participated in the day’s events expressed their support for free speech, including the three undergraduate student panelists: Harrison Duran, Jason Matthew Miguel and Kamyar Nekoui. The best remedy to speech we don’t like is more speech. Harrison Duran, president of the College Republicans, was one of the panelists. Duran, whose group has invited controversial conservative commentator Ben Shapiro to UC Merced, acknowledged that free speech can be a polarizing topic. After the lecture, he said his group hopes to make the Shapiro appearance an inclusive event. The Chancellor’s Dialogue brings leading scholars to campus to discuss pressing issues confronting higher education today through a series of conversations and public lectures. Speakers in the series have made lasting contributions to their fields of study and our understandings of interdisciplinary research, and have demonstrated a commitment to broadening opportunities for participation in sciences, engineering, humanities and the arts.